That looks great, what kind of 3-D printer are you using? It's a Makerbot Replicator 2. It is very slow to print in higher detail. I've mostly done set pieces, but I am interested to test it on replacement faces. 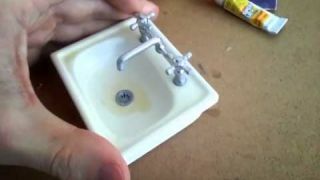 Your sink looks smooth, even if it was a little rough you might get away with that if there aren't any close-ups.